A charity has moved into new temporary offices after their old building was damaged in a crash involving a bus and a car. The Guide Dogs for the Blind Association have relocated to offices in Orton Southgate, after the previous premises in Broadway in Peterborough city centre were damaged in a crash on Christmas Eve. 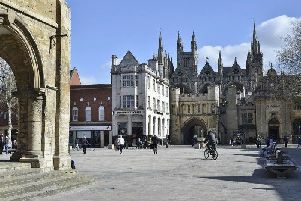 It is thought the new offices will be the charity’s home in Peterborough for at least the next three months while repairs are carried out. A spokesman for the charity said: “I can confirm that staff based in the regional office in Peterborough are moving into temporary office accommodation in Orton Southgate today (Monday, January 11). “Our current estimate is that they will be there for three months whilst the current building is uninhabitable and repairs take place to the front of the building. “Staff have spent the past week gathering together all the things they need from the office to take with them to the temporary space and ensuring they are in a position to carry on with business as usual. “The charity Guide Dogs would like to reiterate our thanks to everyone who has shown support and concern for all those affected by the incident. A police investigation into the crash is still ongoing.